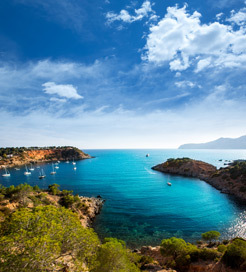 The four largest Balearic Islands are Mallorca, Menorca, Ibiza and Formentera, and there are a number of ferry routes that link them to mainland Spain as well as to each other. 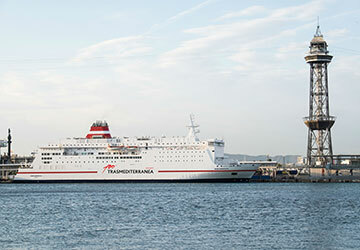 Barcelona, Valencia and Denia connect the mainland to the Mallorcan ports of Alcudia and Palma, ensuring that motorists can access this Balearic Islands from various locations on the coast. Mallorca is in general an island that has tourist hotspots and modern towns in equal measure, and Palma is a great place to start your Majorcan adventure with vibrant shopping streets and historical attractions. Menorca is often considered to have a quieter and more relaxed way of life than Mallorca, and holidays here tend to have a slightly higher sense of sophistication. The route from Barcelona to Ciutadella runs frequently, and it is also possible to sail directly to Mahon from Barcelona and Valencia. The coastline of Menorca has a number of areas of outstanding natural beauty, and you may even find it hard to believe that such a small island can have so many beaches - each one looks even more inviting than the last. Ibiza is a Balearic destination that has gone through a major rebranding exercise in recent years, and modern Ibiza is about far more than all-night parties and trance music. San Antonio is a cultural and historic tourist destination, and the modern cuisine is all about offering visitors both fine dining and family-friendly eating experiences. In a similar manner to Mallorcan ferry routes, Ibiza can be reached by sea from Barcelona, Denia and Valencia on the Spanish coast as well from the islands of Formentera and Mallorca. Formentera is smaller than the other major Balearic destinations, but it is still worth a visit - a trip to Formentera is a unique experience that cannot be found anywhere else in Spain or its islands. The link to Denia is the only ferry connection with mainland Spain, but as there is a regular crossing between Formentera and Ibiza you have the operation of travelling from the mainland to Ibiza and then catching a connecting ferry to Formentera which takes less than 30 minutes. Whichever route you take or island you decide to visit and whether you are travelling on foot or with a vehicle, you can take advantage of the extensive ferry network on offer. Taking a few weeks to tour between the islands is a great idea when booking value for money ferry tickets in advance, and it provides a refreshing change to arriving by plane. The Catalan influences throughout the islands will appeal to those who usually prefer a holiday on the Costa Brava or Costa Dorada.